While a lawn edger isn't essential to maintain a healthy lawn, anyone who likes their lawn edges to be perfectly manicured will find a lawn edger to be indispensable amongst their yard tools. Lawn edgers perform an entirely aesthetic duty, creating crisp lines along the edge of a lawn by making a small trench between the lawn and another ground surface, usually a driveway or sidewalk. If you enjoy the visual benefits of having a clearly defined boundary around your lawn and are considering purchasing one of these useful yard tools, read on to discover which would be the best lawn edger for you. Here’s why you might want one of these tools and what you should look for. Why do you need to edge your lawn? Visual Appeal. The benefits of lawn edging are predominantly visual. The pristine look of clean lines around a lush lawn gives quite an impact and the impression that the plot and the property is well maintained. Higher Sales Price. The curb appeal produced by lawn edging is particularly important if you are looking to sell your home, as it gives a good first impression when buyers approach the property that it has been well cared for. Edging your lawn can make it look neat and tidy, even if you haven't put particular effort into any other areas of lawn maintenance. The clean lines of the edge of a lawn are very visually appealing, sending the message that you are proud homeowners. Weed Barrier. 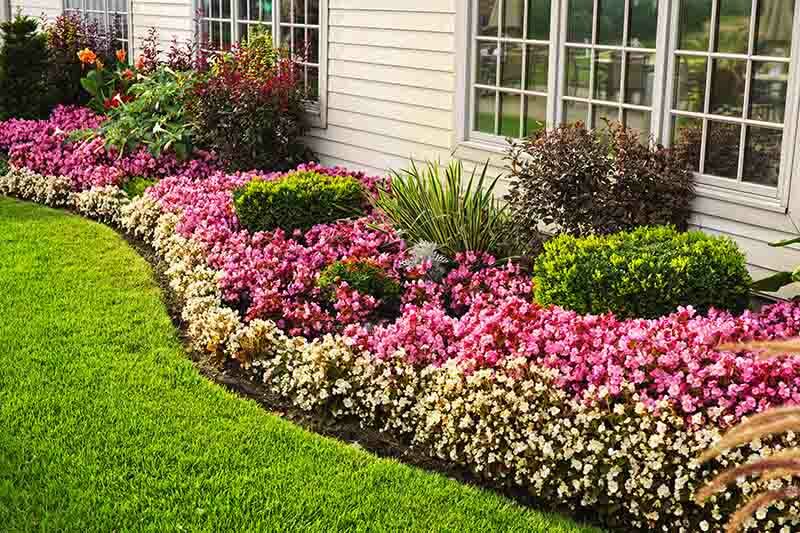 One other benefit of lawn edging is that the trench between your lawn and your flower beds can provide a root barrier. This helps to prevent weeds from crossing over in the soil and causing unsightly growths amongst your flowers. Do You Need a Lawn Edger? Professional Look. Lawn edgers are not a necessity to achieve a healthy lawn. However, they are a clever tool to help you achieve the much sought after look of a professionally edged lawn. If you are keen to clean up the lines around the edge of your lawn, then a lawn edger specifically designed to complete that task could be an invaluable tool. “If you’ve got a lawn, then it’s a sure bet that you will need some kind of edger” (Handy Man Magazine). Save Time. Owning a lawn edger will save you the time and the back pain usually caused by trying to edge your lawn with a spade or an edging blade. These options involve some serious physical labor and can cause long-lasting damage to your shoulders. In spite of the time or care you put into edging your lawn manually, it is unlikely that you would ever be able to achieve the seamless and pristine clean lines that a battery, corded, or gas-powered lawn edger can produce. Save Money. Buying a lawn edger could also save you money if you currently pay a landscaping service to edge your lawn for you. Learning to use a lawn edger is relatively easy, with some models being fairly foolproof, so if you don’t mind being hands-on in your yard, then purchasing a lawn edger could pay for itself with only a few uses. The type of lawn you have and the amount of work you are willing to put into your yard will likely dictate which sort of lawn edger will best suit your needs. 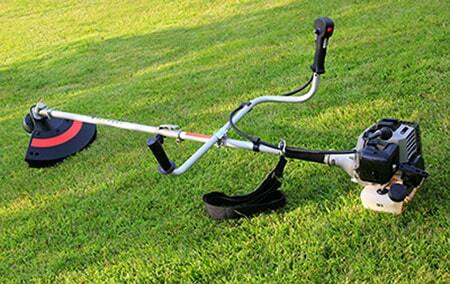 Most people feel that a large gas-powered lawn edger would be unnecessary for a small lawn, as they are large to store and require more time and preparation to set up than a corded or battery powered equivalent. However, if you have a large lawn, or own several plots of land which you would like to edge, then a gas powered edger may serve you better. Gas powered edgers are generally more powerful, last longer, and will achieve a more professional and precise edge than their battery powered or corded counterparts. They also usually come with a higher price tag, and so may be an unnecessary expenditure unless you have a lot of lawns to edge. Battery powered lawn edgers are really only suited to people who have a small area to edge. The batteries in these lawn edgers will be rechargeable, but the charge usually lasts much less than an hour. If you need to use your edger for longer than thirty minutes to an hour at a time, then having to pause to recharge the battery could be extremely frustrating. Battery powered edgers are also renowned for being less powerful than alternatively powered edgers, and therefore may not be particularly well suited to rough terrain or very thick strains of lawn. If you like to multitask when doing your lawn work, then it may be helpful to look for an edger that doubles up as a trimmer, trencher, or mower. Having a tool that can perform several different jobs can make your yard work a more convenient and seamless operation. And combining several tools into one can also get you more bang for your buck. Green Industry Pros note that “a multi-tool unit with an edger attachment allows users to do more with a smaller equipment investment” (Green Industry Pros). Corded lawn edgers are a good compromise between battery powered and gas-powered edgers. They generally offer a good level of power without the hassle of having to fill up your machine with gas and oil. Depending on the brand and model, they can deliver professional results, but obviously require mains power, so be sure to have an extension cable handy if you are working on a large lawn. Some lawn edgers work better on curves than others, so research the pros and cons of a lawn edger before you buy it to check it will perform the duties you need it to. If you have curved edges to your lawn, you may need to find a lawn edger that specializes in this task. Your own personal ability will affect which lawn edger best suits you. If you struggle to handle large or heavy machinery, then a lightweight battery powered edger may be your best option. Or, if you are tall, then an edger that has the advantage of height adjustability may be better for your comfort. Operating a lawn edger will differ depending upon the type of edger and the model. Edgers feature blades and, therefore, it is essential to follow user manuals to ensure optimum safety. As noted by Turf Magazine, “a high-quality finished product depends on doing the job the right way” (Turf Magazine). Here are our reviews of the top lawn edgers available today. The Top 6 Lawn Edgers - How do They Compare? Our reviews of the six best lawn edgers include corded, battery powered, and gas powered options, as all of these types have their advantages that will suit differing needs of the user. The two gas-powered edgers had little in common except for their power source and their metal frames. The Southland promised bells and whistles with added features, such as curb hopping and blade angling for beveled edges, but didn't deliver results as well as the McLane when it came to the basics. The McLane delivers 4.75 torque power compared to the Southland’s 3.5, and users noted that the McLane was sturdy and built to last. Some described the Southland as being flimsy and cheaply made. However, the Southland costs considerably less and performs reasonably well for a budget option. The two battery-powered edgers from WORX and Black+Decker also double up as trimmers. They both switch easily between functions and are lightweight with adjustable handle heights. The Black+Decker has the added advantage of a longer battery life and is supplied with two batteries compared to the WORX one. The two corded edgers are both 12 amp, easy to assemble, and equally easy to handle. They’re both lightweight with adjustable blade and height features. The Greenworks model offers a four-year warranty and a zero carbon footprint while the Black+Decker edger doubles up as a trencher. This electric tool from Black+Decker promises high performance with a dual switch to choose between accelerated performance or longer running time. One battery can run for up to an hour, and an extra battery is supplied to ensure you always have one charged and ready to go if the other cuts out while you’re using it. This two-in-one tool aims to make easy work of keeping a neat lawn with an automatic feed spool and a rotating wheel to convert from edger to trimmer. This is a lightweight product at 5.7 pounds with an adjustable height to minimize back strain for the user. Users of this product have been impressed with the automatic line feed, which is usually an issue with other trimmers. The longer battery life is appreciated by most users, although some have commented that it did not last as long as they were expecting before needing to be charged again. Many users have noted that they were pleasantly surprised by the power of the trimmer, as a battery powered tool is generally not expected to be as substantial as its gas-powered counterparts. However, this trimmer easily tackled dense weeds in high power mode, with all of the benefits of a lightweight, easy to use battery-powered tool. A common disappointment among users was the edger tool which was only good enough to use for maintaining a neat edge, rather than creating one. This three-in-one power tool from WORX is a cordless trimmer, edger, and mini mower, running on a 32V lithium battery. It changes position in seconds without the use of any additional tools, giving you the flexibility to seamlessly switch between trimming, edging, or mowing your lawn. The telescopic height adjustment feature makes this tool a favorite among taller users who often struggle to find yard tools they can operate without having to bend over. This power tool comes with three preloaded spools of cutting string. You can order extra spools free of charge when you require more; you’ll just need to pay the shipping charge. The wheels act as a support while the adjustable guard helps to protect flower beds and acts as a handy guide to ensure you keep on track. Users of this multi-tool have had plenty of positive things to say about it, in particular how lightweight and easy to use it is. Anyone who struggles to lift heavy tools for a sustained period of time might find this edger to be of benefit. It is easily maneuverable and works quickly and effectively, so there is minimal physical input required from the user. The main complaint amongst users was that the auto-feed for spooling the trimming line did not work well, and doing this manually was a frustration. The three-hour battery charging time was also a letdown for this product with many users recommending keeping a second battery charged up for when the first one runs out mid-use. This 12 amp corded edger from Black+Decker converts to a trencher without the use of any tools. It has a three position adjustable blade height as well as an adjustable height handle that can be operated by left and right-handed users. Users of this tool love how effective it is while simultaneously being simple to operate. Some users who were inexperienced with garden tools commented on how intimidating gas powered tools can be, and therefore, this corded option was a great alternative while still giving a professional finish. The edger is lightweight and easy to handle, which may be of particular benefit to anyone who struggles to cope with the physical labor involved in using a gas powered tool. Users recommend this edger for a small to medium-sized garden, noting that it would be sufficient for a large area if a long enough extension cord was used, but would probably not stand up to vigorous use. Some users believed the edger was well built while others described it as being constructed of flimsy plastic. This corded edger features an adjustable blade to customize the depth of cut, and a 12 amp motor to ensure it can tackle thick lawns. Greenworks offers a four-year warranty on their products, as well as a promise that all of their products have a zero carbon footprint while in use. Users love the power they get with this tool without the hassle of having to deal with gas. Most users agree that it cuts a neat line easily, is quick to assemble, runs quietly, and is sturdily built without being too heavy. Some users commented that this tool produces more of a professionally finished edge on lawns than the edgers that convert from a trimmer, so it may be most useful to homeowners who would prioritize a sharp and clean line around their lawn over the capability to quickly convert from one tool to another. The main complaint among users of this tool was the plastic blade guard, which is held on with a few flimsy screws, and easily comes loose. Some users also noted that the blade did not last very long, and the cost of replacement blades was unreasonable. This McLane gas powered edger offers 3.5 horsepower and 4.75 gross torque. The 9-inch blade is adjustable for blade control, and a curb wheel is available to buy separately if needed. The frame is built from heavy duty steel and is coated with chip-resistant baked-on paint. Users of this edger love how powerful it is, producing clean lines with ease and cutting through tough turf flawlessly. Users were also impressed that it starts up the first time, every time, and noted how simple the depth adjustment was to use. Most users agreed that this piece of yard equipment was a long-term investment that would pay off, expecting it to last for many years and continue to operate at a high standard. One niggle that many users noted was a problem with the throttle travel, which confusingly will only go half way down. It seems to be a minor design flaw, though it does not affect use. Some users commented that operating this machine was a steep learning curve. The only way to know how close to place the machine to the edge of the lawn was through trial and error. The power and precision of this edger will give expert results with an experienced user, while someone who is not practiced in operating a gas powered edger may produce a more amateur looking finish. Users recommend persevering with this edger because the results you can achieve after a few practice sessions are impressive. Some users were disappointed that the curb wheel was not included with the purchase of this product though. This gas powered edger by Southland boasts a 79cc engine, delivering 3.5 pounds of torque with manual recoil that is easy to start. The triangular blade is adjustable to five different depth settings and can be angled for beveled edging. The wheels of this edger are all adjustable, making transitions up and down curbs relatively seamless. Constructed with a metal frame, this is a heavy duty piece of yard equipment that should be able to withstand extensive use. This tool receives very mixed reviews from users with some being impressed with the numerous features it offers, such as beveled edging and curb hopping, while many complain at the lack of quality in the build of the edger. Numerous users found that the edger started leaking fuel from the bottom of the motor after only a few uses, and would find whole tank loads of gas spilled onto their garage floor. Other users noted that it did not start reliably and that the blade should be more rigid. Many users were disappointed at the lack of power and found that they had to push it more slowly than expected. In spite of the many drawbacks noted by some users, others recommended it thanks to its value for the money. Happy customers commented that it was cheaply made, but performed reasonably well considering the cost. This may be a good option if you are looking for a gas powered edger on a tight budget. The best lawn edger for you will depend on your own circumstances: the type of lawn you have and the level of work you are willing to put into your lawn, and sometimes your preferences. And we have done our best to recommend the lawn edger for each type. And whatever choices you make, we really hope that you'll have the greatest lawn edge and look for your lawn.